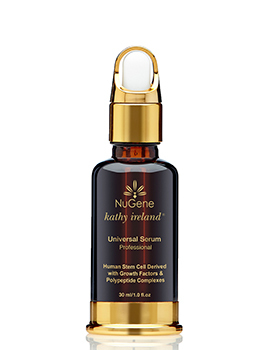 Kathy Ireland's NuGene Universal Serum is formulated to improve skin texture and thickness, reduce the signs of aging and restore the skin's luminosity. 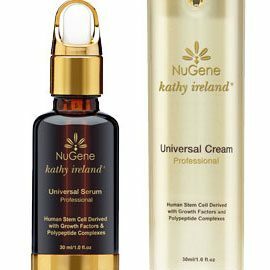 Kathy Ireland's NuGene Universal Cream is formulated to reduce the appearance of fine lines, wrinkles, puffiness, dark circles and reduces the signs of aging. 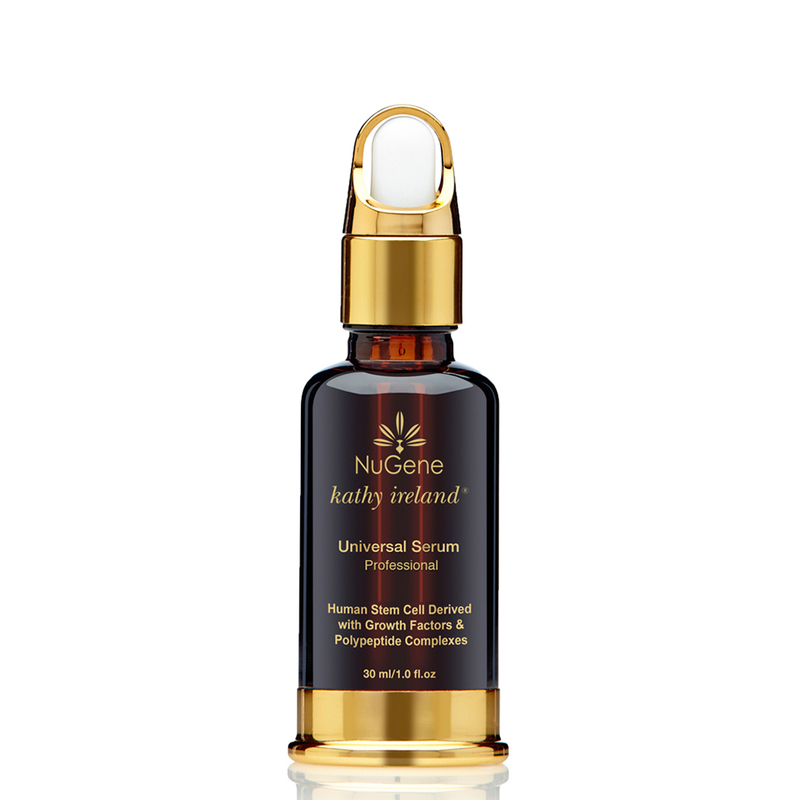 Kathy Ireland's NuGene Universal Serum (nighttime) has demonstrated in clinical studies the ability to stimulate the production of collagen, elastin and hyaluronic acid, resulting in skin that appears more hydrated, thicker, smoother, tighter and more flawless. This powerful yet ultra-light serum designed for your nightly skin maintenance routine encourages aging skin to behave more like younger skin, resulting in an unmistakable improvement in the appearance of wrinkles, fine lines, dark spots, rough texture and skin tone after 8-12 weeks of use. Additionally aloe vera gel and caprylyl glycol add moisture and hydration to the face resulting in a smoother appearance. Growth factors, peptides, niacinamide, and antioxidants combine to rejuvenate the skin while reducing the appearance of future damage and aging, improving skin texture and thickness, and restoring skin's luminosity. 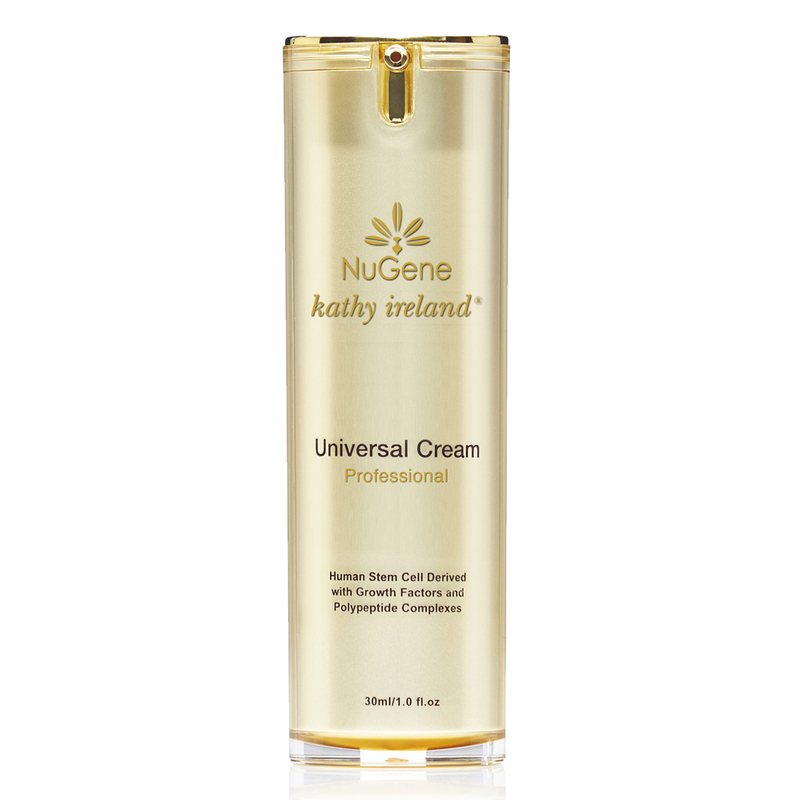 Kathy Ireland's NuGene Universal Cream (daytime) is formulated to reduce the appearance of fine lines, wrinkles, puffiness, dark circles and reduces the signs of aging. A newly formulated, patent-pending, stem cell technology created to improve the texture and tone of the skin. This innovative cream is designed to increase the collagen (the fibers that give strength to the skin), elastin (the protein responsible for making the skin elastic allowing it to return to its original shape), hyaluronic acid (keeps the skin looking young by allowing the skin to retain moisture), epithelial cells (protects the body from sunlight and germs) and other matrix protein synthesis. The universal cream is gentle and designed for even the most sensitive skins. Directions Universal Serum: Apply one pump to face and neck each morning and evening. Massage until absorbed. For best results follow with NuGene Universal Cream. Directions Universal Cream: Apply one pump to clean face, under eyes and neck every morning and evening. Massage until absorbed. Warning: For external use only. Avoid contact with eyes. Discontinue if rash or irritation occurs. Keep out of reach of children. Store in a cool dry place.